Congratulations to "Patricia B. ", the winner in Diane's giveaway. Please contact JUST ROMANTIC SUSPENSE to claim your prize. Your happy place is where you’re at peace. It might be your back deck where you drink your morning tea and watch the sun rise while birds fill the air with song. Or the beach where you can dig your toes into the hot sand and listen to the crashing of the surf. Mine is the Eastern Sierras of California where the trees stand tall, the sky is achingly blue, and the views stunning. Idyllic childhood memories play a part in making this corner of the world my happy place. Back in the 1970’s, if you took the turn for Convict Lake off of Highway 395, you’d soon arrive at a resort that looked like it had come right out of the Old West. We (Mom, Dad, me and my sisters, Ellen and Sandy) all stayed in one of the tiny, rustic cabins built back in the ‘30s. There was a small general store where you could buy Baby Ruths, comic books, and salmon eggs for bait. Horses hitched out front stood ready for pack trips into the backcountry. In the early mornings, Dad would take his girls to the lake with their fishing rods so Mom could sleep in. We girls would spend the hot afternoons with the absolute freedom to hike through the aspen groves and clamber around the creek as much as we wanted, until we returned in time to eat grilled trout for dinner. Then of course there was the summer when my older sister, Ellen, discovered boys. There was apparently a cute one staying a few cabins away from ours. She’d make us walk back and forth, nonchalantly, of course, in front of his cabin, hoping to get noticed. Fast forward to 2009. Dad had passed away from cancer in 2006 (don’t smoke folks, cancer is a horrible way to die), and Mom in 2008, from multiple system atrophy. MSA is a horrific degenerative neurological disease. We’d had some tough years. Ellen had the idea that we should rent cabins at Convict Lake on the one-year date after Mom’s passing. Sandy couldn’t come, but Ellen and I packed up our families and took that long drive north. The resort had changed, more upscale and more expensive than it used to be. The market is still there, though the horses have been moved. The little cabins remain, and best of all, the crystal waters of the lake still reflect the soaring granite peaks of the Sierras. It was the perfect place to remember our parents. I’d been thinking of getting back into writing, and that trip sparked in me the idea to use the Eastern Sierras as the setting for a series I wanted to write. The germ for the idea of my fictional town of Hangman’s Loss came from the history of Convict Lake. The resort that Emma inherits from her grandfather is inspired by my childhood memories of the resort at Convict, and the town itself is a melding of the towns of June Lake and Mammoth Lakes, both not far from Convict. It thrills me to bits to share with my readers my love for the Sierras by making those beautiful mountains a character in my books. For the past several years, my husband and I have managed to take camping trips to the Eastern Sierras a couple times a year. Our kids are grown, so it’s especially nice that our son will occasionally join us. This past summer we hiked farther into the back country than we’d ever gone before, and were rewarded with some of the most awe-inspiring views you can imagine. Those trips are when I can unwind and soak in the peace and beauty of my happy place. Where’s your happy place? What makes that place special for you? 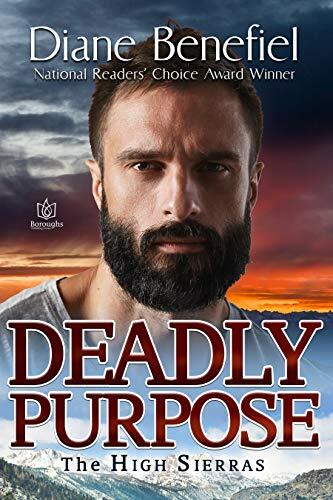 Comment for a chance to win a digital copy of DEADLY PURPOSE! Giveaway ends 11:59pm EST February 6th. Due to GDPR regulations you no longer need to submit your email address in the comments. If you have been selected as a winner your name will be posted at the top of the post. You may then contact maureen@justromanticsuspense.com to claim your prize. Your email address will be shared with the author/publicist providing the giveaway. My happy place was our family camp. It was on a small lake in the Adirondacks in Northern New York. Sitting on the dock listening to the loons and just enjoying the peace was wonderful. I often took off into the woods to hike to the top of one of the surrounding mountains. There were no trails and I don't think I ever went the same way twice. I found something new every time I went out. Unfortunately, I never seemed to be able to find it again. We live about 15 hours away now, but going back would be difficult. A relative owns it and has let the cabin fall into disrepair and won't let anyone use even the beach. I now find my peace in the mountains or on a small mountain lake. We always look for them when we travel. Sounds beautiful! I've never heard a loon and would like to experience that. It's sad that you can no longer go to your happy place, but it's nice that the memories of the many good times you had there stay in your heart. Thanks for sharing. My happy place was my grandparents' home... miss it. Yes! I dreamed of my grandparents home for years after my grandmother died. Maybe that's your happy place because it's where you felt safe and loved. Thank you for sharing. My happy place is anywhere my husband and dogs are. But I must also have my Kindle or books! I love your other two books in this series and am looking forward to reading this one!